Earlier this year, I got the opportunity to see both North By Northwest and Vertigo on the big screen. Each of those posts started with talk of being weaned on Hitchcock from about the age of 12 and into my 20's. 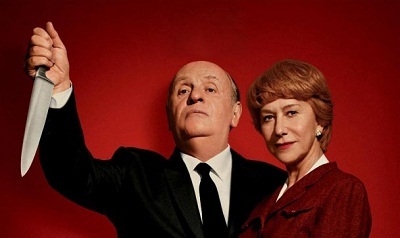 So you can imagine, I was truly looking forward to this biopic about the life of Alfred Hitchcock starring Anthony Hopkins as the Master of Suspense. It's easy for me to be taken in by movies that recreate the old Hollywood film studios; where everyone was on contract, and many writers and directors had offices on the premises where they came to work everyday, even when they weren't currently doing a picture; and the guard at the gate addressed executive, director and star by name as they drove their convertibles into the lot. Growing up loving celebrities that were big way before my time, allowed me to get a little thrill when Scarlett Johansson, who plays a credible Janet Leigh, refers to "Tony and the kids" and you know she's talking about matinee idol Tony Curtis and at least one of the kids being Jamie Lee Curtis. 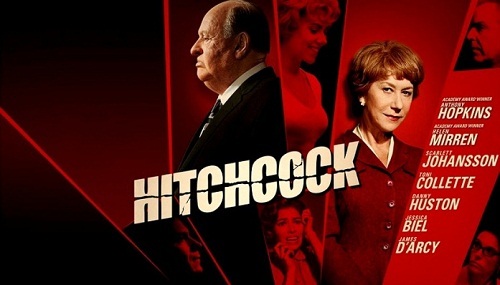 Most audiences are going to want to see this movie for "the making of " Hitchcock's classic thriller Psycho; particularly the filming of the shower scene - in which Hitch dismisses the ineffectual stunt killer, grabs the famous knife and begins to torment poor Janet Leigh with violent stabbing motions that come far too close for her to have to "act" terrorized. Also supposedly it was Hitchcock's wife Alma Reville (Helen Mirren) who insisted the screeching violins, violas, and cellos by composer Bernard Herrmann be used as the sound to accompany this iconic killing. Unfortunately, although the structure of the story centers around this time period (filming Psycho) in Alfred Hitchcock's life, it's not actually what this movie is about. 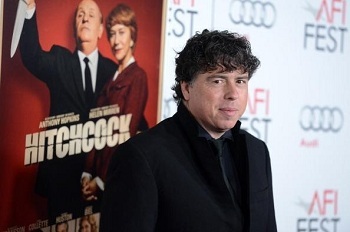 Director Sacha Gervasi was chosen to direct Hitchcock, even though his only claim to fame is some doc about a heavy metal band called Anvil: The Story of Anvil. In an interview (click for video interview on Shock Til You Drop) Gervasi says they did base some of the movie on Stephen Rebello's book Alfred Hitchcock and the Making of Psycho (in my opinion not enough), but ultimately he wanted to focus in on Hitch's mischievous, tongue in cheek side, and the relationship he had with his talented wife, who was never paid or credited for her enormous creative contribution to each of his films. The result is a very dissatisfying light and frothy rom/com of sorts. The movie centers around the romantic jealously of Alma over Hitch's obsessions with his cool blonds, and in turn, Hitch's jealousy over Alma's friendship and working relationship with a struggling writer, Whitfield Cook (Danny Huston), which all rings false and cheap. Anyone could have written much of the often trite dialogue (screenplay by John J. McLaughlin) there is no real insight into the actual inner workings of what I'm sure was a very layered marriage. The only part of the movie that hits a more Hitchcockian note are the scenes with Ed Gein (Michael Wincott) the real life killer the Anthony Perkins character is based upon. He's only a figment of Hitchcock's mind, but the dark creepiness of these scenes are more in keeping with the tone I had envisioned for the film. I will say this movie awakened in me a renewed interest in seeing Psycho again; it was never one of the Hitchcock movies I watched frequently, probably been almost 20 years since last I saw it. Hopefully it's streaming on Netflix. Food Footnote: In this movie we get to see why Hitchcock's famous silhouette was so rounded. 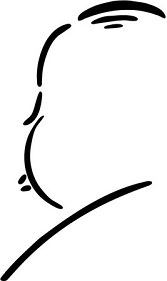 He tended to be a binge eater, who gulped wine as if drinking water on a hot day. It would seem that Alma's only failure in her life with Hitch was never managing to keep her husband on a diet and exercise regime.